1. General: This one hour lesson is designed to give the students only a general awareness of the format and content of Soviet troop control documents and the richness of their map symbology. 2. Sublesson Introduction: Explain to the students that in one hour you will only cover the subject very broadly. Only through extensive practice will they become adept at drawing Soviet map symbols. For the purpose of this course they will use pre-drawn map symbols and fill in the blanks in prepared combat documents. 3. Teacher Learning Objective: The students need to acquire a general understanding and familiarization with Soviet combat documents, plans, and maps as quickly as possible in order to begin to accomplish the practical exercises. They obviously need this information also to perform their functions in the OPFOR headquarters. From this brief exposure, they will not be able to create Soviet plans, maps, or other documents unaided. However they should at least become sufficiently familiar with them so that they won't feel afraid to start using Soviet forms in their course of their work. Otherwise they will usually fall back on using American army methods. The question is frequently raised, well, why not just perform the functions of the Soviet staff but use U. S. map symbols and combat document forms? We believe the Soviet planning method is so integrally tied to the conceptualization of decisions "on the map" and the structuring of orders in terms of the document forms in use, that it is essential to absorb these aspects of the Soviet "mentality" in order to take the role of Soviet staff officers in an OPFOR staff. The following tasks are designed to begin this process of acculturation. Task: Describe the types of artillery documents prepared by the artillery staff. Condition: Given prepared forms and student handouts. Standard: The description should differentiate between the three kinds of documents: troop control, information, and reference. Refer students to the Handbook on Soviet Planning, Chapter Six for samples of many documents and text discussing the nature of combat documents. Task: Describe Soviet map symbols. Condition: Given prepared maps and sets of map symbols. Standard: Students need to gain some familiarity with Soviet map symbols to enable them to complete the practical exercises in later lessons. Show various symbols and point out how they are created logically by building on a basic symbol. In this course we naturally focus on the symbols required for artillery plans, the students will gain familiarity with other symbols in the other courses. Task: Describe the Soviet plan map. Condition: Given prepared maps and map symbols. Standard: The description should include the division, army, and front artillery maps. Using a wall sized sample go through the parts of the map in sequence showing what information is depicted at each level. 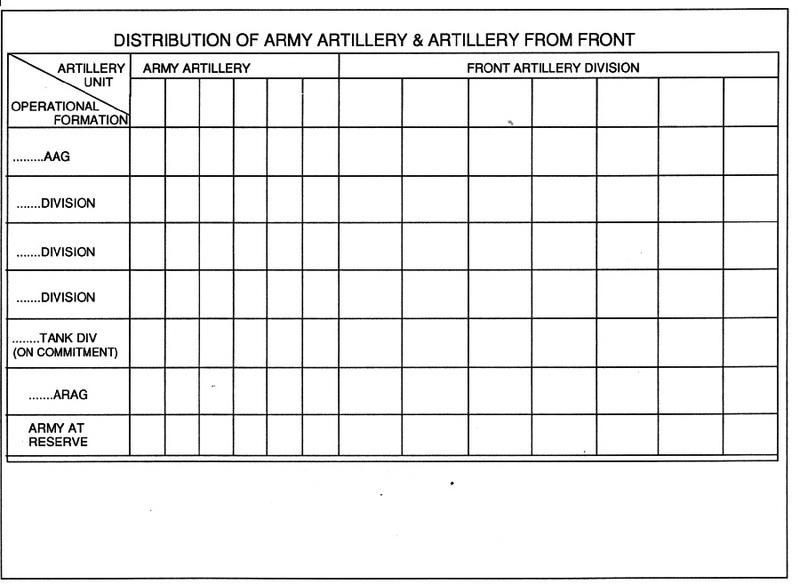 The description of the content of the artillery map is given in the Handbook. 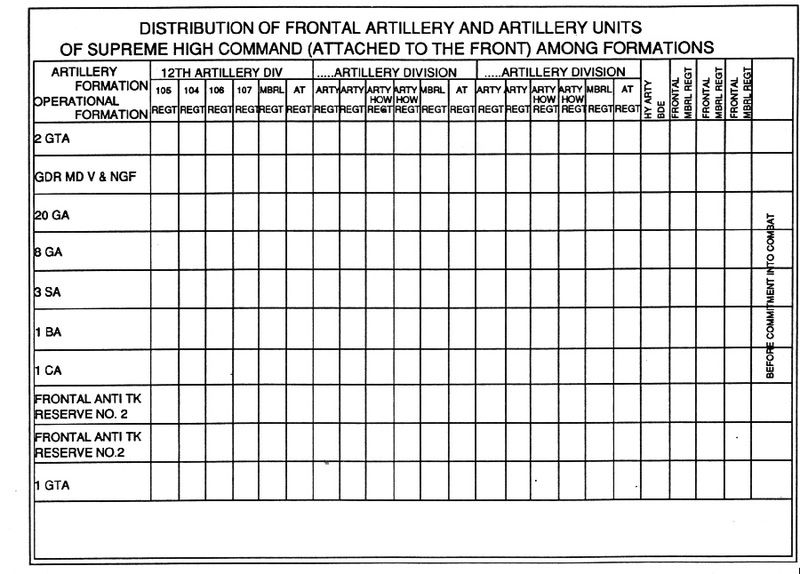 The artillery map shows the basic skeleton of the indices of the operation as a framework on which the artillery units and their missions are presented in great detail. One principle is to depict artillery units two echelons below the headquarters preparing the plan. 4. Level of Instruction: Survey. 5. Method of Instruction: Lecture with demonstration of samples of maps and documents. 6. Author's Intent: Overall - The purpose of this hour is to familiarize the students with the general nature of the materials they will be handling during the practical exercises to come. They cannot be expected to learn much about the Soviet theory or rationale behind the use of various map symbols or the whys or wherefore of Soviet combat documents. In the practical exercises they will "fill in the blanks" and prepare maps and documents "by the numbers". Only after much exposure to these materials through usage will they become fully comfortable with them. The instructor will have to adapt his discussion to his observation of the current level of student knowledge of maps and documents. a: types of artillery documents - The student should be familiar with basic Soviet combat documents relating to artillery. There is not enough time for the students to become thoroughly adept at creating original documents. This would only come with extensive practice, but the instructor can show examples of each main document with both standard, generic, unfilled-in forms and completed versions. The students will gain further ability to use the documents be filling in sample forms during the practical exercises. b. map symbols - Again, full ability to identify Soviet map symbols will only come with extensive practice, however, the instructor can provide a full set of the symbols used in these exercises and can discuss some of the general principles of their construction. This should aid the students in their initial work with Soviet artillery planning maps. For the practical exercises the students will receive cut-outs of prepared symbols to place on their maps so they won't be required to learn how to draw the symbols immediately. c. marking artillery situation on map - This period will be a short practical exercise in using the map symbols. The instructor should focus on discussion of just what information is shown on the Soviet map and what is not shown. He may use samples of Soviet artillery maps placed on the wall or diagrams representing Soviet artillery maps, which might be placed on the table. The instructor and course organizers will have to determine how many copies of maps to provide, (or the reverse, how many students they believe should use one map or diagram. This period requires a student handout showing Soviet map symbols, packages of predrawn symbols and blank schematics in place of maps. The students should also receive sets of all the documents they will be working with later in the practical exercises. The particular references, which should be available for further study, are Pombrik, I. D. and Sherchenko, N. A., The Officer's Map, Moscow, 1985, JPRS trans. ; DIA books on Soviet may symbols. 8. Homework: none, but students should read course materials prior to class. Lesson III - Introduction: The purpose and content of this hour of instruction. --- instructions on all types of support. --- operation and reconnaissance summaries. --- various table, diagrams, and other reference materials. --- deploying artillery reconnaissance means. - instructions on all types of support. - operation and reconnaissance summaries. - various table, diagrams, and other reference materials. 12. other elements of combat formations. 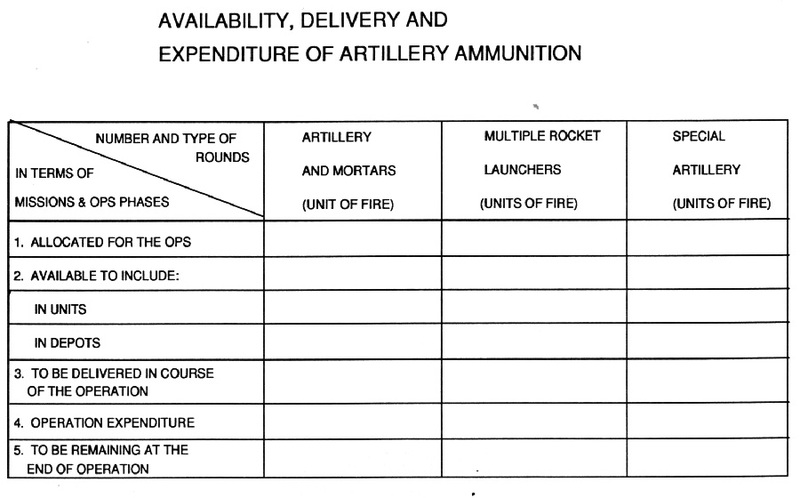 5. composition of antitank reserves. 4. measures for protecting troops against mass-destruction weapons.VG - Points in the graphic part of the artillery plan. The effectiveness of troop control and maintaining mission-oriented coordination in the activities of the staff in troop control are directly related to the formulation, transmission, use, and storage of combat documents. Combat documents include all documents related to organization, preparation, and conduct of combat actions (operations). 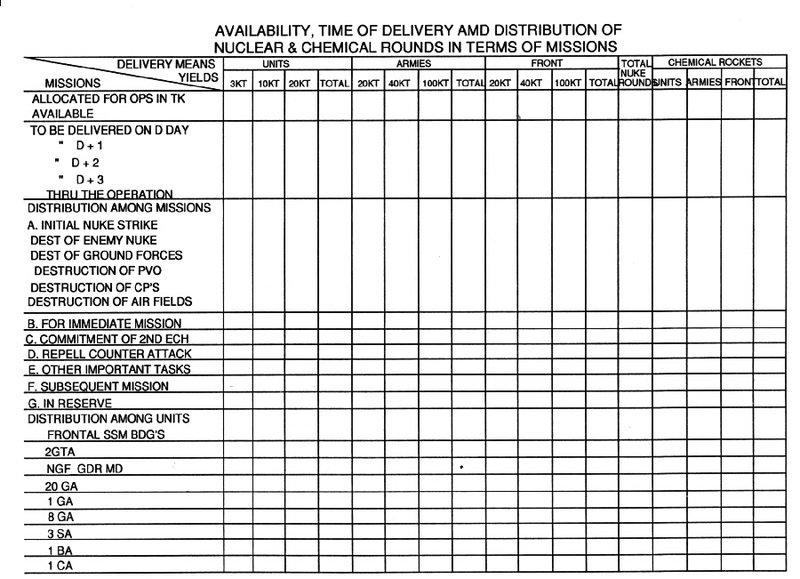 Combat documents also include documents connected with movement and deployment (concentration) of the troops on the terrain. They are used in the process of preparing data, formulating the commander's decision, planning combat actions (operations), and in disseminating missions to the troops. In addition, they are used to transmit necessary information to higher, lower, and interacting headquarters and to summarize and disseminate experiences of combat actions. Therefore, combat documents are considered general-purpose information means which affect all control organs, since some formulate them, some insure their transmission, some organize accountability and storage, and others are guided by these documents in their practical activities. The documents contain information needed for troop control displayed by letters, figures, set drawings, and symbols. Preparation and duplication of combat documents is normally conducted with the help of technical documentation equipment. These documents are easy to store, transport, and transmit over all modern technical communication equipment. In addition, written combat documents have a great legal significance and their storage in archives makes it possible to study and analyze the experiences of preparing and conducting combat actions. Moreover, combat documents are one of the most convenient forms of feeding information into a computer and its subsequent processing and output. --- accounts, combat action logs, wrap-ups, maps, diagrams, etc. --- data on the amount and delivery time of ammunition, various tables, diagrams, and other reference materials necessary in the work of the control organs. --- Formalized form: Includes documents drawn up with the help of special forms which are pre-prepared for specific types of combat documents. The formalized documents form consists of two parts - fixed and variable information. The fixed part of the form includes the description of information (group of information) which is always contained in a given combat document and also the corresponding codes. The variable part of the form is filled out while preparing the document. To fill out the form, means to state clearly and specifically only that information, the descriptions of which are indicated in the corresponding lines of the fixed portion of the form. Experience gained from exercises indicates that commanders and staffs spend a lot of time preparing combat documents. Therefore, in order to speed up the preparation of combat documents, cut the preparation time, and also to insure the working out of the combat documents in accordance with prescribed specification and requirements of combat manuals (regulations), necessary pre-prepared formalized blank forms should be established. At the same time the recommended forms for various combat documents should not be very rigid (structured) in order to prevent them from negatively affecting the initiative and creativity of commanders and staff in preparing them. Depending on the availability of time, the characteristics of the assigned missions, and the method of conveying missions to the executing elements, the form of such documents can be adjusted. The form of formalized documents (blank forms) should be suitable to use in case of employment of nuclear weapons or without the use of such weapons. In the later case irrelevant points are crossed out. In contemporary times experiences of various exercises indicate that one of the important characteristics of troop control is the ever-increasing volume and complexity of information which must be received and processed in the interest of accomplishing troop control tasks. This entails an increase in the number of documents prepared by staffs, while at the same time reducing the time for developing them. Resolution of this contradiction is one of the important problems of modern troop control. At the same time, it is necessary to take into account the increased demands for documents and the broad possibilities of using technical equipment for their development, formulation, transmission, processing, and depiction. Secrecy, accuracy, and speed have always been the principle requirements in preparing combat documents. Today combat documents must also be as brief as possible and permit machine processing. They should be clear and concise in statement, have a high standard and clarity in design, and be easy to document, duplicate, transmit, process, and display by technical equipment. Another important requirement of a modern combat document is its timely development and transmission. In order to achieve the brevity, clarity, and conciseness of statement in combat documents, concise and clear wording, standard abbreviation, and conventional signs must be used. In all combat documents, particularly directives, only extremely necessary information, orders, and combat instructions should be included without repeating already known information or irrelevant information and data known to the recipients from other sources. It must also be noted that brevity of documents does not degrade the clarity and must not subject the statement to different understanding or interpretation or raise questions or necessitate additional explanation. When including situation data in combat documents such as the time, status, and character of action of friendly and enemy troops, only verified information should be included. Information requiring verification or clarification should be so stated, if there is a need to show it in the document. Clarity of graphic documents is achieved by using appropriate symbols, conventional signs, and setting off the content of the document against the background of the topographic features of the map. Clarity is also achieved by using the appropriate colors established for conventional signs. The graphic document should not be cluttered up with textual data and tables. Reference and explanatory texts should not block the topographic background of the map. Given the various capabilities of technical equipment for documentation and reproduction of combat documents and for transmission of textual and graphic information and their processing, the capabilities of available technical equipment must be taken into account in preparing the documents in terms of size, structure, color combination, and others. --- speed and reliability of the transmission equipment. Since the form and structure of combat documents greatly affects their preparation and transmission time and their overall effectiveness as combat documents, one way of further improving combat documents is to find new forms and structures. The introduction of formalized documents (blank forms) is part of the effort. Formalization of combat documents insures a substantial reduction in the size of the part of the document being developed and reduces the time to prepare and transmit it over technical communication equipment, while the load on the equipment is significantly decreased. In addition, formalization helps to standardize documents and eliminates duplicate and superfluous information in them. Moreover, the possibility of using formalized combat documents for transmitting and processing information in automated control systems is another important advantage of formalized documents. The formalized documents can be easily used as input into a computer without any kind of preliminary preparation. Furthermore, the use of formalized documents simplifies the transmission of information when conducting troop control of multi-national troops of a coalition force. This reduces the problems caused by language barriers. Despite all advantages of formalized documents they can not replace all of the usual forms of combat documents, particularly in peacetime and when adequate time is available to prepare combat documents during the preparation and conduct of an operation (battle). Therefore, it is recommended to formalize only those combat documents which are characterized by a relatively consistent set of information needed for troop control and are frequently and regularly circulated and which should be sent quickly to headquarters and the troops. 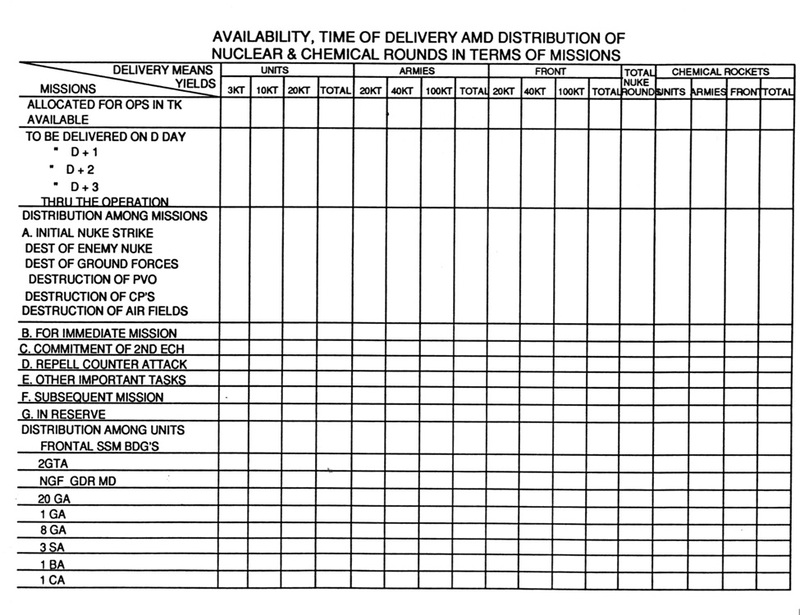 These will primarily include combat instructions issued in the course of combat action and the information and accountability documents (Otchotno-enformatsioni dokumenti) such as combat situation reports (Boyevie Donisenie), operational and reconnaissance summaries, reports on different types of support, combat action logs, etc. One of the most convenient forms for preparing and transmitting formalized documents is considered to be the questionnaire form structure. In addition to the questionnaire form structure of the formalized document, a tabular form may be used. 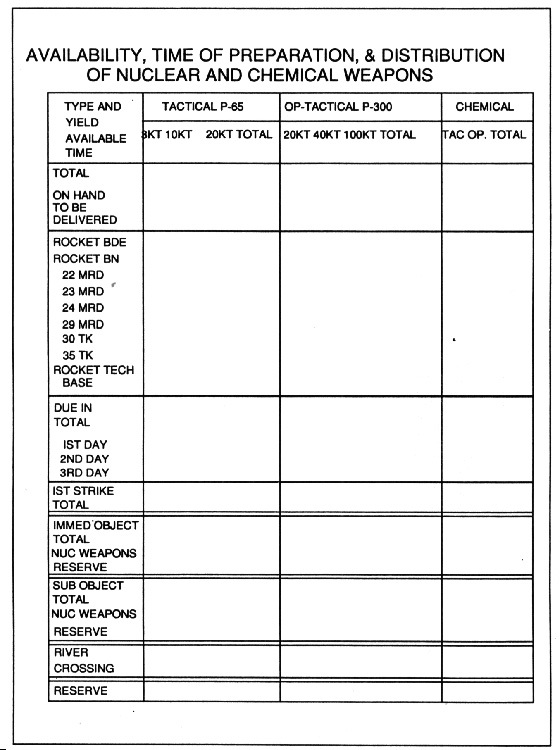 Formalized document forms can be published as tablets of forms as applied to each type of combat document. After development of the document, the form is torn off and the drafter and time of development and transmission of the document to the communication center are indicated on the remaining stubs. These form tablets, have their own permanent numbers, and are provided to all staffs between which the corresponding types of combat documents may be circulated. The procedure of preparation and transmission of combat documents is specified by the orders, instructions, and directions of the commander and the chief of staff. The specific listing of combat documents to be prepared in actual situations is specified by the chief of staff on the basis of the commander's instructions, higher command's directions, and the prescribed priority report log. The chief of staff determines who must develop which documents, the procedure and times for submitting the documents for signature, and the method and forms of transmitting them. On the basis of the instructions of the chief of staff, the heads of staff directorates (sections), chiefs of arms and services, and heads of working groups within the control organs, organize direct development of related combat documents and assign specific officers to prepare each document. The drafters of such documents are instructed on the content of the documents, form of their design, and the number of copies and deadlines to prepare them. The chiefs of staff directorates (sections) and chiefs of arms and services and other control organs follow and track the preparation of assigned combat documents and at the prescribed time submit them to the commander and chief of staff for signature and approval. --- remarks on time of dispatch and reception of the document by the addressee. --- when several situations (at several times) are shown on the map, the markings related to different times are distinguished by different color shadows or other marks (dots, crosses, dashes, etc. along solid lines). In order to expedite the preparation of combat documents, their development can be conducted concurrently with making the commander's decision. Specially prepared blanks of standard combat documents can be of great help in making the required documents in a short time. They include a set of texts on various types of combat actions (operations) applicable to various command levels, the nature of missions to be accomplished, and the types of operations (battles). Transmission of combat documents is conducted both over technical communication equipment and by postal-courier service or staff officers. The selection of specific methods of transmitting a written document is determined by taking into account its importance, the time allocated for its dissemination, and also the transmission reliability requirements. The staff is obliged to inform the commander or the chief of staff of subordinate troops about the dispatch of operational directives, operation orders, and instructions, indicating when and how the document was sent. The receipt of operational directives, operation orders, and instructions, including those transmitted over technical communications equipment, is acknowledged immediately. The operations section in addition to keeping itself informed, is responsible for disseminating information. this is done by means of verbal and written reports and answering inquiries. In addition to keeping the commander and the chief of staff informed, the operations section must keep the next higher headquarters, other staff sections, staffs of chiefs of arms and services, and subordinate staffs informed, and must provide for mutual exchange of information with adjacent staffs. This responsibility is assigned to one of the assistant chiefs of the operations section. Inquiries from the next higher headquarters, usually from the operations section or the operations duty officer, normally are answered orally, using prearranged message codes and map codes. In addition to oral reports, the operations section prepares written reports, the most important of which are the combat report and operations summary. The operations section also maintains the journal of combat operations and at army level maintains the summarized report of combat experiences. --- the second part contains new enemy order of battle information and enemy activities. --- the fourth part contains requests for assistance (additional units or equipment) if the situation requires it. The combat report, if directed to the next higher commander, is signed by the lower commander and his chief of staff. However, combat reports may also be submitted to the chief of staff of the higher headquarters, in which case they are signed by the lower chief of staff and chief of operations directorate. Shorter combat reports are frequently sent over radio or wire. ---general description of the operation of the unit as a whole, evaluation of enemy and friendly operations, locations of the main forces at the time of the summary was prepared, a listing of the losses, and a brief description of friendly and enemy air activity. --- description of the operations of each subordinate unit (separate paragraph for each unit). 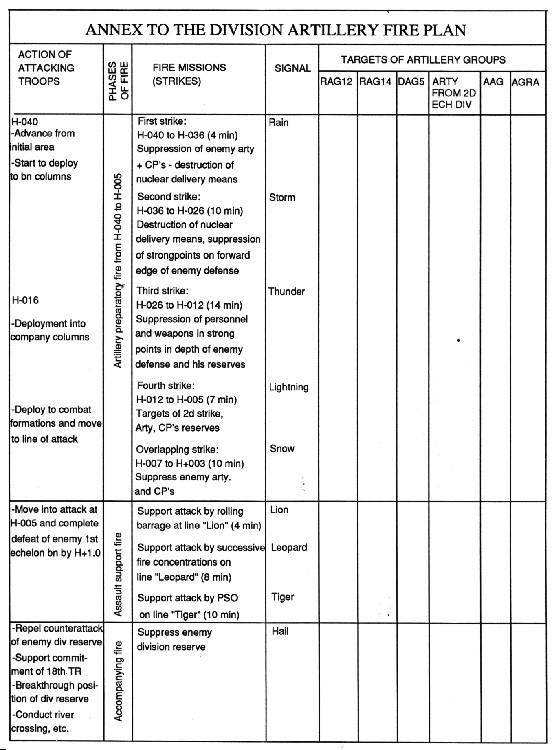 Situation and condition of each unit, losses and capabilities, and major episodes involving contact with the enemy. --- general description of enemy activity, with particular emphasis on typical characteristics observed in enemy organizations, methods of combat, and use of arms and technical equipment. The enemy's tactical and technical concepts, fortified areas, defensive organization and centers of resistance, antitank and antipersonnel obstacles, and similar matters are described. --- conclusions are offered as to the lessons learned as a result of the combat experience of subordinate units during the report period. 3. Missions of means of higher commander in support of this division, missions of adjacents, and, if needed, major questions on interaction. 3. Brief combat action of regiments and others two levels below. The division discusses battalions and the army talks about regiments. The doneseniye information is a staff document of units and formations that report to higher staffs on the enemy. They send it at appointed time or on their own initiative or on request of higher staff. 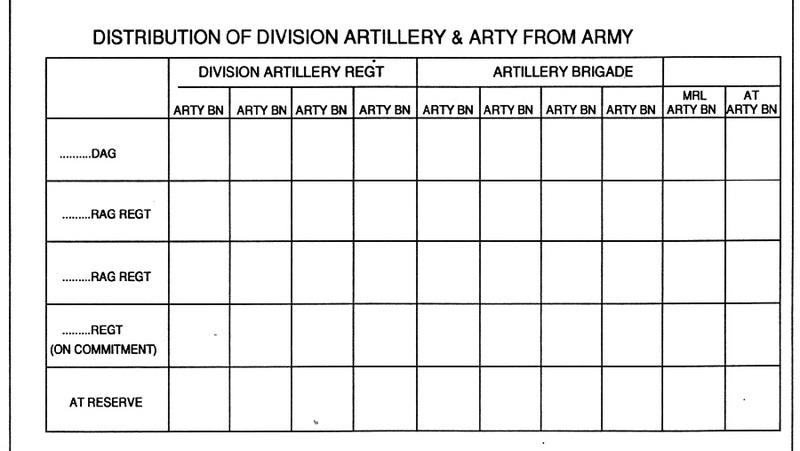 However a reconnaissance svodka is an information document of the staff of units, formations, and higher units on the data on the enemy at a specified time sent to higher staff according to the reports table and to adjacent and lower on enemy situation. --- character of command, composition, and troop control organs including the commander and his capabilities and habits etc. --- maps, information on the enemy organizational set up, tables of organization, number and order of battle, etc., losses of enemy, prisoners, and other explanatory data. --- copies of all important operational documents and maps used for a given operation are appended to the journal. This is a reporting information document which relates to the time of preparation and during the course of combat actions. It is used for developing lessons and combat experience, and making reports and reference material on combat activities of forces, for preparing historical journals and also used for scientific experimental work in the future. The journal of combat actions of units and formations and larger units and ships from first to third rank is prepared and made by officers and prepared by a staff officer appointed to this duty for the duration of the time he is on the army staff. In the journal of combat actions only new data are written but not routine activities when out of action. In the journal there are annexes for operational directives, combat instructions, report maps, and plans for enemy fortified regions, photographs of officers and soldiers mentioned. At an appointed time they make a copy of the journal and send it to the higher staff. The situation report map is used primarily to report the situation to higher headquarters. copies of this map or sketches form the map are frequently appended to reports and summaries. The original map is appended to the journal of combat operations and is considered a fundamental source of material for the preparation of military history. --- actions of enemy forces. The map typically shows most important situations (breakthrough of enemy prepared defense, destruction of counter attack blow, commitment of second-echelon into combat, passing of water obstacles and others). 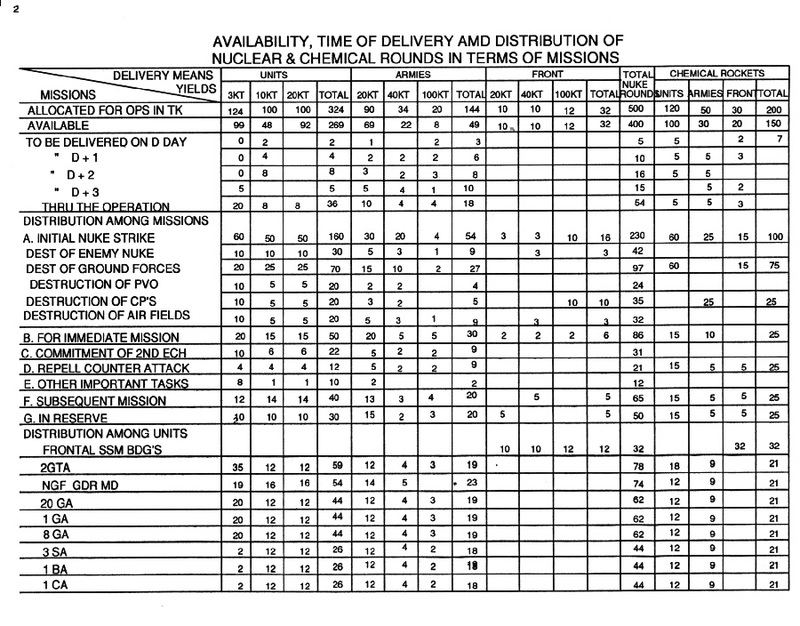 During the conduct of combat actions with use of mass weapons, they show on the map nuclear strikes of both sides, areas of contamination, destruction, movement of forces around destruction areas. Data on own forces is shown for two levels lower. The situation of forces at various times is shown by different symbols or colors in accordance with use of proper tactical symbols. For protection of the surface of the map itself they use plastic and write with special dissolvable solutions. The map for the staff of formations and large units is prepared by an appointed officer in the operational department or directorate. The map for reconnaissance, artillery, engineer, signal, and rear service units is prepared by officers of their staffs. In units they only prepare one map - that is prepared by the assistant to the chief of staff. The various staffs, staff sections, and headquarters elements preparing, receiving, and dispatching operations documents are required to keep current records on the documents and their location. Procedures for recording documents vary with the headquarters; however, in the processing of documents, three basis records are generally required. These are - a "record journal", a "daily record sheet", and the "dispatch book. "~ Receipts are also used to supplement these records. If the contents of documents are transmitted by signal communications, the messages are coded, but the transmitted or received messages are registered in the clear in a "form for recording signal communications." The record journal is primarily a record of documents prepared by the preparing agency. 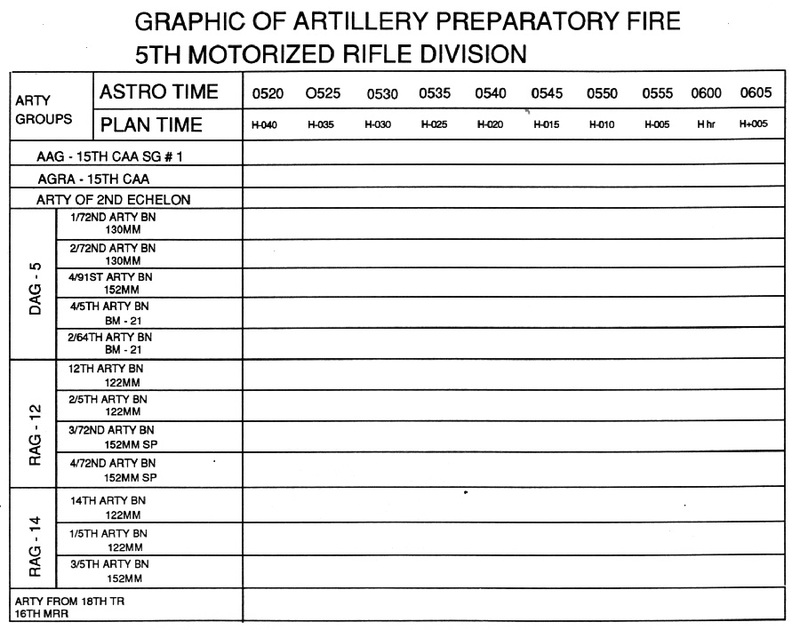 The preparing section keeps a separate journal of each of the various types of documents prepared, such as one for operations orders, one for reconnaissance plans, one for air defense plan, etc. Documents prepared primarily for use within the section such as working documents, as well as documents prepared for dispatch, such as orders, are noted in the "record journal." However, in the latter case, dispatched documents are also noted in the "dispatch book'. The daily record sheet a daily record of all document received. Essentially, it is a record of the identity of the document received, when dispatched, from whom it came, and when and by whom it was received. The dispatch book is a record of documents dispatched. In addition to identifying the document and the sender, this record identifies the messenger and the final recipient and indicates the time required to deliver he document. Receipts are an additional method used to record the exchange of documents. Sometimes, standard receipt forms are utilized, but it is more common practice to have the envelope in which the document is delivered signed by the recipient and retained by the messenger as a receipt. The form is used to record receipt and dispatch of messages and conversations conducted by telephone, telegraph, or radio. The communications normally are coded, but this record identifies the station, participants, and summarizes the communication in the clear. Documents or messages may be delivered by messenger or liaison officer, or transmitted by telephone, telegraph, radio, or liaison aircraft. In the latter group, the contents of documents sent by signal communications are normally coded, and the more important operations documents are sent band received only through the cryptographic section or the staff for coding and decoding. Decoded messages re sent directly to the chief of staff and the operations section. A record is kept of all messages sent or received by signal means in the "form for recording signal communications". Depending on the means of delivery documents arrive in the message center, radio center, central telephone station, or at the air liaison landing strip. The documents are then recorded and delivered directly to the addressee. The addressee signs a receipt, normally on the envelope, making a notation as to the time of delivery, and notifies the sending agency immediately, normally by signal communications. Documents with a dispatch classification of "K", "G", or "B" coming to the command post are delivered immediately to the operations duty officer. He, in turn, immediately sends "K" documents to the addressee and "G" documents to the chief of staff or chief of operations section. "B" documents, with the exception of those addressed to the political section, are opened by the operations duty officer and delivered to the address within the specified time limit or in accord with significance of contents. The documents preparing agency or staff section keeps a record of documents prepared in the "record journal" In addition to recording dispatched documents in the dispatch book, notation is made on the copy retained by the preparing agency, as to the number of copies prepared and to whom, when, and by what means the document or excerpts from the document were dispatched. For delivery, the documents are given to a signal communication agency, to a liaison officer, or to the message center. The documents are then delivered according to the dispatch classification. The more important documents are delivered personally by the liaison officers. The most important documents received by the message center are dispatched immediately to the addressee. Documents of lower category and other correspondence are sent to the message center to be delivered according to priority and schedule. --- all other operations documents. In addition to the staff combat documents, the staff collects for record and historical purposes the individual situation maps and field note books of the unit officers and the forms for recording signal communications. The operations section of the staff has primary responsibility for preparing on the basis of these documents the unit history and other studies to be used for instruction and training. Twice a year, at a time prescribed by the general staff, usually 1 January and 1 july, documents are collected and sent to a central receiving point to be processed for storage in the central archives of the Soviet army in Moscow. The Soviet method for making decisions in which the commander and staff interact has been discussed in the chapters on division, army, and front troop control procedures. It conforms to the description of the dual subordination of Soviet combat arms, special troops, and services chiefs to their commanders and to their counterparts at the next higher headquarters that is shown in the diagram in Chapter One. The procedure is essentially the same for each specialty, ie. artillery, signal, engineer, etc. At the same time that the commander receives the operations directive or order from his superior commander each of these chiefs is receiving instructions on the use of their forces and means from their counterpart. 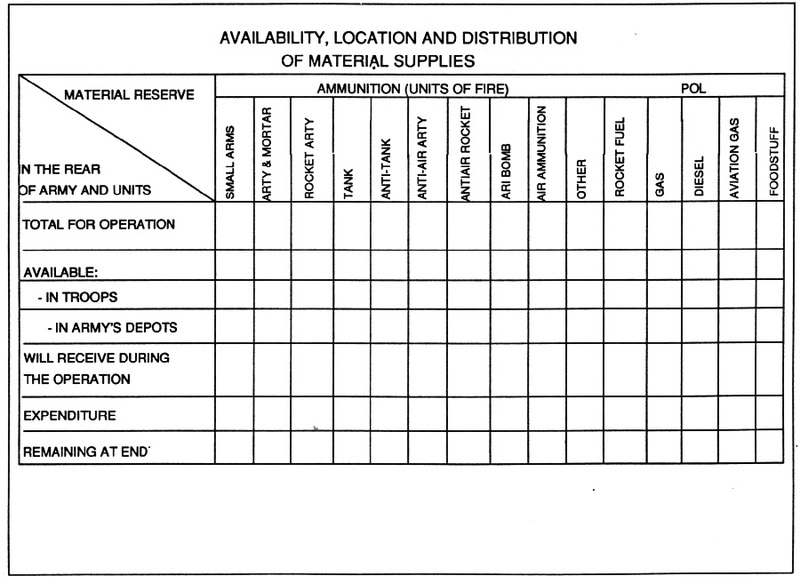 These instructions provide details on the forces and means they may receive as reinforcements from above, what actions the higher level forces will be doing that may affect their level, what activities they will be required to accomplish in the interest of the higher level, and other coordinating instructions relative to their specialty. As the commander clarifies his mission, they also clarify these instructions and prepare to brief the commander. When the commander receives the operations order he also issues his own preliminary instructions to his staff and other officers. After the clarification of the mission the commander and staff begin the estimate of the situation during which the special staff and other officers provide their suggestions as desired by the commander. After the commander makes his decision it is translated into action by the dual channel method. The more general aspects are promulgated in the form of the operations order or instructions to the next subordinate combined arms commander and the special aspects are covered in two sets of special instructions issued by the various specialty chiefs. 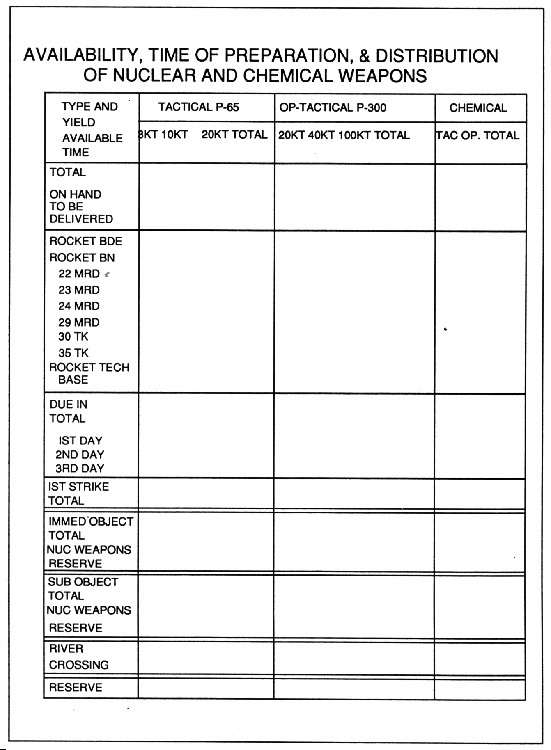 One set of instructions is on the actions of that specialty forces and means directly subordinate to that headquarters (ie instructions on engineer support issued by army to the army engineers troops), and the other set of instructions is issued to the related specialty chief at the next lower combined arms headquarters (ie, instructions on engineer matters issued by army to the chief of engineers at division). This process is illustrated in the diagram in Figure 200.